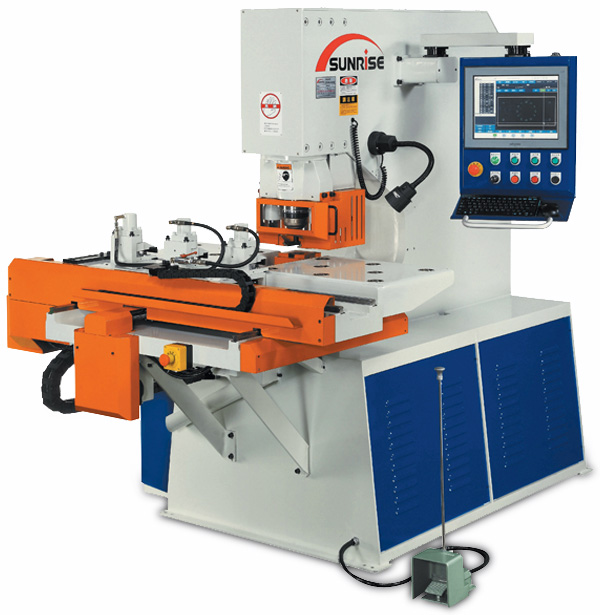 The fully Automatic CNC Punch Systems from SUNRISE can be factory installed on any dual-cylinder or single-end punching system allowing the most versatile punching and shearing machine on the market today. The operator loads the flat plate, engages the hydraulic clamps and begins the automatic punching sequence. The strong servo-motors move the entire plate on both X and Y axis based on the programmed part layout and punches each hole. At the end of the punch sequence, the table returns to the home position for the operator to remove the processed part. The fully automatic CNC punch system includes hydraulic clamps with an integrated pressure sensor for a strong grip on the material. The hydraulic stripper comes with exchangeable plates to suit a variety of punching operations as well as an optional Triple Punch attachment. Ball transfer units on the support table provide smooth material movement, and the cover is complete with an interlock switch for ensured operator safety. Trilogy Machinery will offer 100% factory authorized service and support as well as a full stock of spare parts and accessories in the USA.